When we talk to our "bipod brethren", i.e. our tactical rifle shooting friends, we often hear, "sure the 6BR is accurate, the low recoil is nice, and burning less powder is great, but it won't feed from a magazine so I'll stick to my .308." Well, it's time to re-think that conclusion. Belgian David Bergen has smithed a rugged 6BR in an Accuracy International chassis that feeds like a dream from the detachable magazine. The gun also delivers extreme accuracy with less than half the recoil of a .308 Winchester. With a muzzle brake, the gun doesn't hop or torque, allowing the shooter to see bullet impact on target. 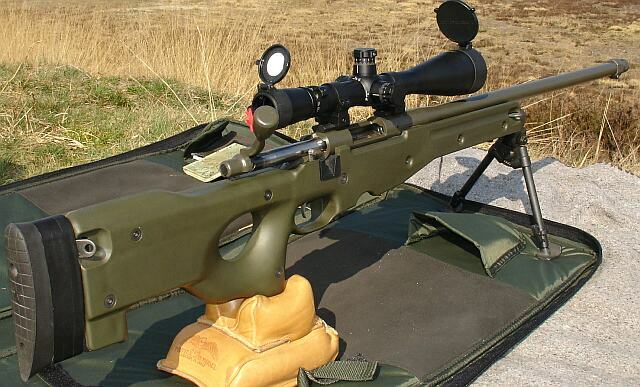 Here, then, is a tactical rifle that stays on target like a .223, with long-range ballistics that rival a .308. What's not to like about that? The 6BR rules the roost in 300m competition, and the 6BR has become the cartridge to beat in 600-yard Benchrest. However, it is still somewhat rare to find a true tactical rifle chambered in 6mmBR. David explained his choice of calibre: "Since I am always looking for better accuracy and reduced recoil in a tactical rifle, it wasn't long before I wanted to build one in my favourite caliber, 6mm BR. The rifle will be shot mostly prone with bipod. I wanted a rig that was durable and accurate but it also had to be portable and comfortable to shoot. I always had a fondness for the Accuracy International (AI) sniper rifles so that’s where I got my inspiration. This gun represents my effort to combine the precision and low recoil of the 6BR cartridge with the renowned durability and field performance of the AI system. The heart of the rifle is a Remington 700 short action that started life as a .243 Win. I wanted a working magazine so I opted for the Accuracy International chassis system. This package comes with a single-stack magazine that I modified for enhanced feed reliability. Barrel is a 26" stainless Lothar Walther Select Match barrel with a 1:8" twist. It is pretty much a straight-taper (1" at the muzzle) stepping up to match the action diameter at the breech end. At the front is a very effective Accuracy International muzzle brake--the same brake AI uses on their AW sniper rifle. The trigger is a Jewell that breaks like the proverbial glass rod. 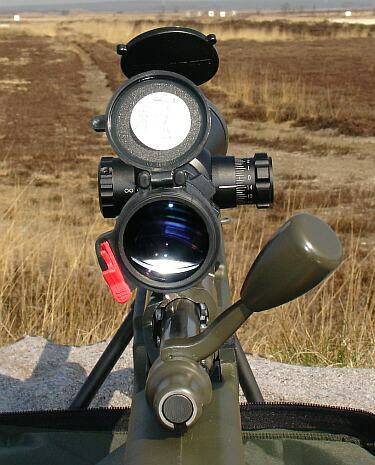 The scope is a Leupold LRT 8.5-25x50 M1, with mil-dot reticle, mounted in Leupold rings and bases. The Leupold's clarity and resolution are excellent, the large M1 knobs are handy to use, and the scope's ample 72-MOA elevation range makes this a very good choice for long-range shooting. Overall it is a very good scope. 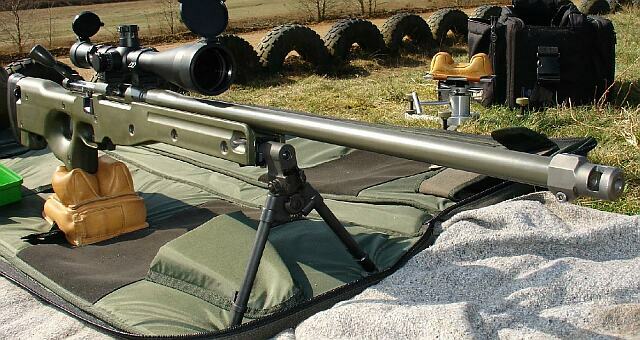 Befitting a hard-working field rifle, this gun is set-up with a no-turn neck to shoot Lapua brass out of the box, as well as factory-loaded 6BR ammo. The chamber is cut with a neck that tapers from .272" at the neck-shoulder junction to .271" at the front. This works great with my handloads and with both Lapua and Norma factory ammunition. My favorite load is 30.2gr of Vihtavuori N140 and CCI BR4 primers, pushing moly-coated 105 Lapua Scenars at 2830 fps. 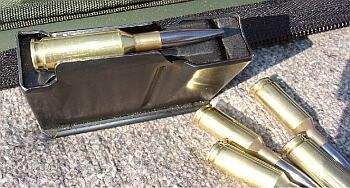 Cartridge overall length is 2.368" (60.15 mm). 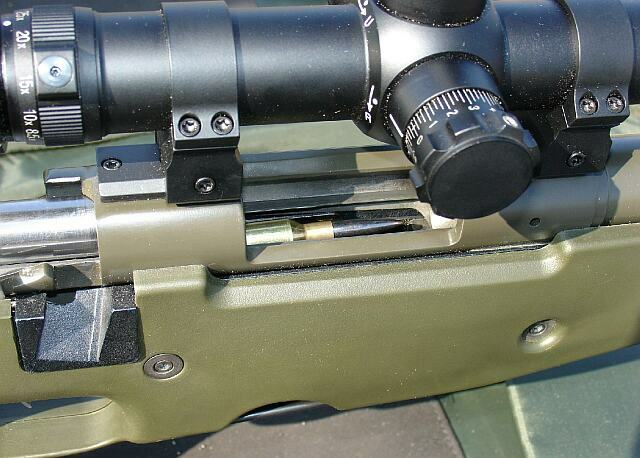 This puts the Lapua 105s into the lands, with square marks. I use a Redding Type S bushing die with a .267" bushing, giving .002-.003" grip (the minimum needed for shooting the moly bullets.) For seating I use a Forster seating die. With its case-hugging sliding sleeve, the Forster "Ultra" Micrometer Seating Die fits the 6BR case very closely, producing ammo with very low run-out. I blue-printed the action using the tools sold by Dave Manson. These tools true everything up--locking lugs, action threads--then the bolt is lapped-in and the lastly the bolt face is trued. Because there is always some play between bolt and action, I always lap the bolt with the trigger installed, so the pressure keeps it at the same position at the rear. At the front, I center the bolt with the front action screw .The same set-up is used when blue-printing the bolt face. This is to keep the bolt in same position it will be when you shoot the rifle. The barrel's counter-bore is cut to minimum size so it centers the bolt in the action. This removes some play from the action. I know better results can be had by sleeving the bolt, but this is a tactical rifle that will encounter dirt and bad weather so it needed some looseness. Mag-Feeding the 6BR--Yes It Works and Here's Video Proof! The AI-supplied magazine is designed for the .308 Win, so it needed some work. The spring required no modification, but I did shorten the follower. Then it was a matter of positioning the round in the magazine. After some trail and error, I settled on a spacer in the front. This leaves a gap in the rear of the magazine, making loading easier. The cartridges move forward with recoil and the movement of the bolt, helping to position the cases for reliable feeding. The ejector needed some tweaking to eject empty cases reliably. I think that a Sako extractor might work a bit better with the short 6BR cartridge--it might grip the brass better. I haven't tried it so that's just a guess. You can make it work with the Rem extractor. As you can see from the Video, feeding is smooth. Taking a follow-up shot is just a matter of cycling the bolt. No problems. CLICK HERE or click the above Media Player photo to launch streaming video. You may note that, in the video, the first shot sounds louder than the second and third shots. That was just an unexpected result of compressing the original video file--don't fret, all the loads were the same. I want to emphasize something very notable about this gun compared to other sniper-style "tactical" rifles--recoil is minimal and you can see bullet impact on target. That is very important in a tactical rifle. Accuracy-wise, this gun always has shot very well. Under field conditions, shooting prone with a Parker-Hale bipod, it delivers repeatable half-MOA accuracy with ease. During load development, using a solid front rest and rabbit-ear leather rear bag, the gun regularly delivers 8-10mm groups (about 0.3 MOA) at 100 meters. 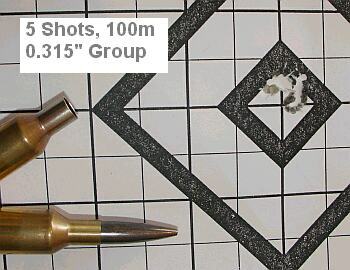 400-meter groups measure around 5 cm for a ten-shot string. The comfortable stock, combined with the muzzle brake, make this gun very easy to shoot. The 6BR -- What Does It Offer the Tactical Shooter? Is the 6BR a good choice for tactical shooting? I think so. First of all, consider that many police "sniper" rifles are chambered in .223 Rem. Well, the 6BR beats that cartridge hands down in every respect (accuracy, energy, and long-range performance) except magazine feeding. Moreover, I've proven that, with a few simple modifications, 6BRs CAN mag-feed reliably. Next, compared to the venerable .308 Win, how does the 6BR stack up? In the "plus" column, the 6BR offers great accuracy, low recoil (55% less than a .308), high BC bullets, and the best factory ammo you can buy. The 6BR stays supersonic longer than the .308, it has a flatter trajectory than the .308, and its retained energy at 800-1000 yards is within 15% of a 168gr .308. In the "minus" column, when compared to the .308, the 6BR has much less energy at short ranges, there is no special purpose ammo (tracers, armor-piercing), and the short round makes it difficult to feed in most rifles. But again, that is just a matter of re-engineering the feeding system. There are plenty of 300m competition rifles that feed 6BR cartridges from magazine flawlessly. Key factors, in my view, are the 6BR's low recoil and dramatically lessened bipod hop and muzzle movement. (Watch that Video to see for yourself.) Set a 6BR up with a good muzzle brake or suppressor and you can see your shot impact. That is very important for a real sniper engaging real targets. Being able to see bullet impact gives you immediate feedback, so you can correct for your second shot if necessary. When you combine the ability to see bullet impact with the intrinsic accuracy of the 6BR, you produce, in my opinion, a "better mousetrap". But what about down-range energy? Plug the numbers in your ballistic program for both realistic .308 Win and 6BR loads and the difference narrows as distances increase. For example, at 800 yards, a 168gr SMK, launched from a .308 with 2700 fps muzzle velocity, has 769 ft-lbs of retained energy. In comparison, a 107gr SMK, launched at 2850 fps from a 6BR, has 665 ft-lbs of retained energy at 800 yards. That's only 13.5% less! (Calculations from Point-Blank ballistics software.) So let me conclude, I'm not saying the 6BR is "better" than a .308 Win, but I do believe the 6BR deserves a place in the tactical arsenal. My club utilizes the shooting range of the Belgian Army. We can only shoot on weekends, but it's just a 30-minute drive from my home, so I count myself lucky to be able to shoot here. It is a large facility with many different shooting ranges from 50 meters to 800 meters. You can shoot airguns, clay pigeons, handguns, practical pistol, silhouette, black powder, high-power rifle, and military rifle matches. This venue is really a rifleman's dream. We can shoot 50m and 100m on a range with mechanical target-movers so you don’t have to walk to change your targets. There are two other 100-meter ranges, (one with covered firing line), plus a 200-meter range, and a 300-meter range with covered firing line. The 300-meter range is used for shooting UIT or CISM matches and for training when the weather is bad. We also have two 400-meter ranges, one shown in the photo at right. These we use for the prone matches. The long-range matches are very popular, attracting 40-50 shooters from Germany, The Netherlands, France and of course Belgium. For our 600m and 800m matches we use an electronic scoring device, the SIUS ASCOR. It is really quite amazing--you can see your impact on a television screen next to you. Because the system employs an acoustic target, in order to register, your bullet has to be supersonic+ when it arrives at 800 meters. We've found you need around 1400 fps for reliable scoring. That is problematical for the .308 shooters. The better shooters are now using the 6BR, 7mm-08 or the 6.5-284 for shooting 600m and 800m." For information on shooting in Belgium, click here: Belgian Shooting Clubs. Topics: AI, AE, AW, Accuracy International, Int'l, Remington, Sniper, 300m, F-TR, F T/R, 6mm, 6mm BR Norma, 6BR, .308, 7.62x51, Tactical, Target Rifle, Magazine, Mag, Clip, Score, Group, Agg, Aggregate, Benchrest, .223, Sling, Iron Sights, 6mm Improved, Light Gun, 6PPC, Hart, Krieger, 300m, 600m, 1000 yards, NightForce scope, Jewell, Benchrest, BR, Bench Rest, rifle accuracy, Recoil, Bipod, Parker-Hale, Wind, BC, Ballistics, Norma, Hodgdon Powder, Varget, N150, N140, Reloader, Vihtavuori, Lapua, Scenar, Competition Shooting, Stocks, Leupold, M1, Mil-dot, Badger Ordnance, Badger Rings, Lothar Walther, barrel, reloading, powder, case forming, neck-turning, Lapua Brass, bullets, precision, Belgium.